Hello and Happy Monday! I survived the day and at some point I had my doubts I would! Why oh why are weekends not longer! I made a card tonight for The Paper Players Challenge Blog. To check out the challenge and link up your own card, click Here. Love the map background with the ship image, this is wonderful! Thanks for joining us at the Paper Players! What a great combination of stamps - you even managed a cloud! 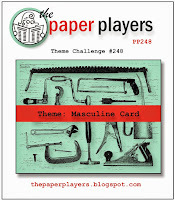 Thanks for joining in with my masculine challenge over at The Paper Players this week! Fabulous masculine card! The vintage yet clean look is very cool. Thanks so much for joining us at The Paper Players. A lot of GOOD stuff going on TIna! :) Great card. Thanks for joining in with the Paper Players! 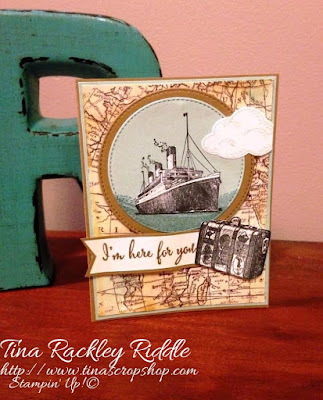 I love the stitched circles that look like a porthole on a ship!